1. Wash and soak both raw, par boiled rice along with urad dal and fenugreek seeds in water for 3-4 hours. 2. Using a grinder grind the soaked rice and dal for 10 minutes slowly add the shredded coconut and coconut water along with water to help grind the batter. 3.Make sure the batter is in an almost smooth paste not in a super smooth consistency.You may have to adjust your grinding setting accordingly. 7. Drop 2 dollops of batter in the centre of pan and holding the handles of the pan do a swirl of the pan to spread batter to appam. Cover with a lid to let it cook for 2-3 minutes. 8. 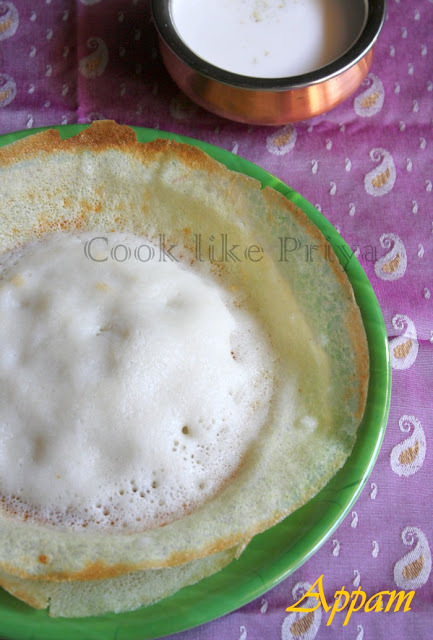 Once the sides of the appam change colour/ start to turn golden and the centre is cooked remove from pan. In a mixer grind the shredded coconut in batches with water. 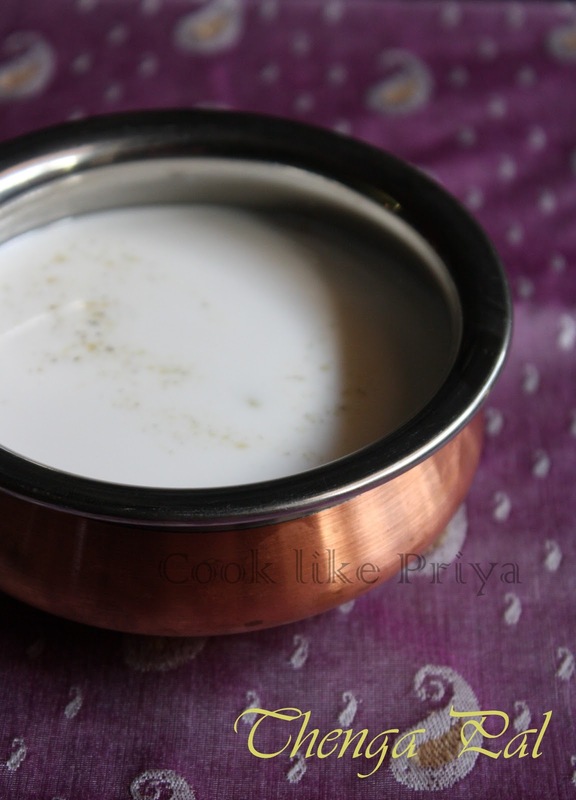 Using a fine sieve/ strainer extract maximum coconut milk. Add the cardamom powder, sugar and mix well to dissolve. i don't have the kadai, planning to get one soon...your pics are making me hungry...soft & yummy Appam..perfectly done Priya..too good! It's my fav but am too lazy to make, the process is like so tedious. Therefore contented with buying from the shop. I am loving this lovely home made version and yes to lots of coconut milk on top. 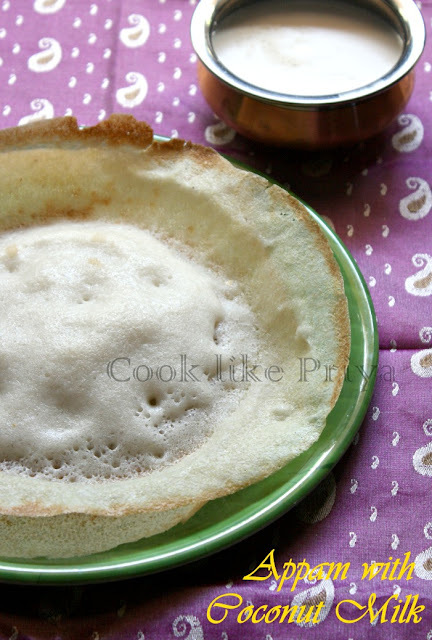 Perfectly made appam.. Outerr layer is crisp and inner layer is soft.. Forgot to bring appam kadai here.. Missing it a lot..
Appam looks fabulous da.. Love to have it with coconut milk.. Delicious and lovely looking recipe. 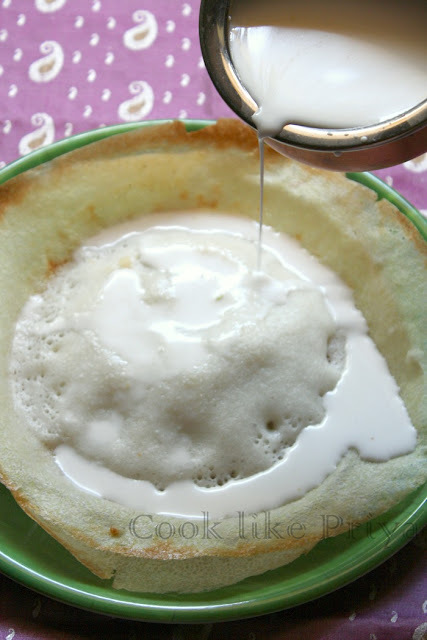 Appam with coconut milk is an awesome combination. Love this, it's been so long, have to make this..